As some investors anticipate the end of the stock market decline, others remain worried and some of their concerns are grounded in fundamentals. Experts are lowering their outlook for earnings and economic growth. These stories seem to be under-followed by media analysts but they could be important. After all, the stock market tends to reflect the outlook for growth in earnings and those earnings depend in part on the economy. A slowdown in the economy could explain the troubling decline seen in the earnings outlook. 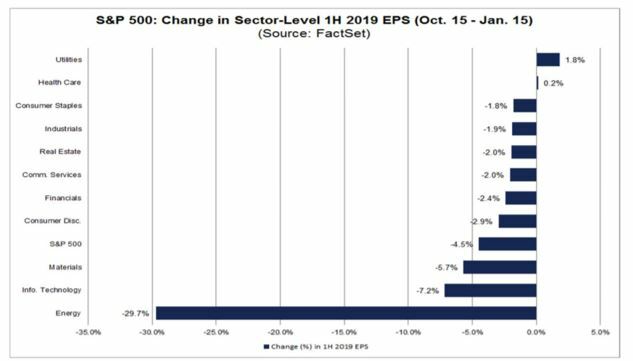 Over the past three months (October 15 through January 15), analysts lowered earnings estimates for companies in the S&P 500 for the first half of 2019. The Q1 (first quarter) bottom up EPS (earnings per share) estimate (which is an aggregation of the median EPS estimates of all the companies in the index for Q1) dropped by 5.0% (to $39.37 from $41.43) during this period. The Q2 (second quarter) bottom up EPS estimate (which is an aggregation of the median EPS estimates of all the companies in the index for Q2) decreased by 4.0% (to $42.36 from $44.13) during this period. Combined (adding the Q1 2018 and Q2 2018 bottom up EPS estimates), the bottom up EPS estimate for the first half of 2019 (1H 2019) decreased by 4.5% (to $81.73 from $85.56) over the past three months. 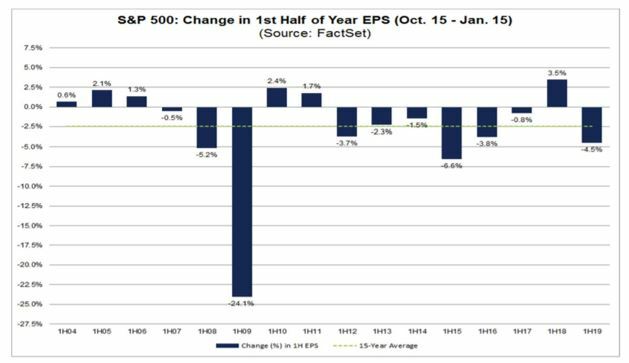 How significant is a 4.5% decline in the bottom up EPS estimate for the first half of a year during this period? How does this decrease compare to previous years? Over the past fifteen years (CY 2004 to CY 2018), the average decline in the 1H bottom up EPS estimate from October 15 through January 15 has been 2.4%. Thus, the decline in the 1H 2019 bottom up EPS estimate was larger than the average over this time frame. In fact, the 4.5% decline marked the largest decrease since 1H 2015 (-6.6%) and the fourth largest decrease since 1H 2004 over this period (October 15 to January 15). Looking deeper, the lowered expectations were broad based. Ten of the eleven sectors recorded a decrease in price during this period, led by the Energy sector (-14.4%). Reports now indicate that as part of its latest quarterly economic outlook report the International Monetary Fund (IMF) just slashed its forecast for 2019 global GDP to just 3.5% from 3.7% as of October. This is its lowest forecast in three years. In the report, the IMF warned that trade tensions pose further downside risks to global growth and other factors also weigh on growth. The report notes that “In its second growth downgrade in three months, the IMF blamed softening demand across Europe and recent stock market volatility. 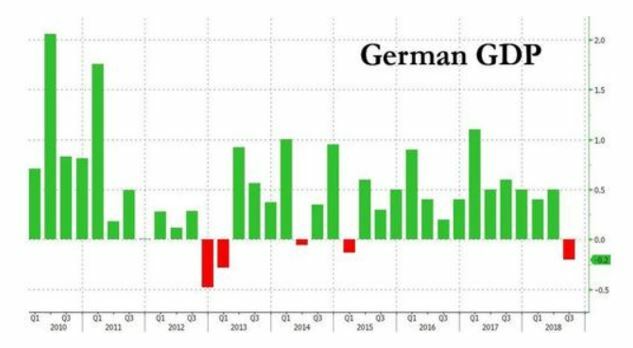 While its US GDP forecast remained somewhat surprisingly unchanged, still seeing a solid 2.5% in 2019 GDP growth, the IMF took a machete to its German GDP forecast, which the IMF now sees growth only 1.3% this year, down 30%, or 0.6% from its forecast last October. The Monetary Fund blamed soft consumer demand and weak factory production after the introduction of stricter emission standards for cars was behind the shift. The IMF still expects GDP to grow 6.2% in 2019 after 6.6% in 2018 – the lowest since 1990 – and to continue slowing due to the trade war and the government’s failing attempts to reduce systemic leverage. CNBC reported on China’s recent report. “China announced that its official economic growth came in at 6.6 percent in 2018 — the slowest pace since 1990. That announcement was highly anticipated by many around the world amid Beijing’s ongoing trade dispute with the U.S., its largest trading partner. There were a few bright spots in [the] official Chinese economic data. Industrial output grew 5.7 percent in December from a year earlier — beating economists’ expectations of 5.3 percent growth — outpacing November’s 5.4 percent growth. Retail sales data rose 8.2 percent in December on-year, in line with a forecast and up from November’s 8.1 percent gain. “What we’re seeing in the fourth quarter is that, while the economy is decelerating, we actually still have some support from most of the quarters from the export front-loading,” said Helen Zhu, head of China equities at BlackRock, referring to exporters rushing to ship their goods out of China before new U.S. tariffs hit. Zhu told CNBC that even though she expected some support from Chinese consumption and tax cuts, growth in 2019 will decelerate this year compared with 2018. Although Beijing’s official GDP figures are tracked as an indicator of the health of the world’s second-largest economy, many outside experts have long expressed skepticism about the veracity of China’s reports. “The official GDP figures have been too stable in recent years to be a good guide to China’s economic performance,” said Julian Evans-Pritchard, senior China economist at Capital Economics, a research house. “But for what it’s worth, the headline breakdown suggests that service sector activity strengthened slightly last quarter,” he added. Chinese statistics bureau chief Ning Jizhe told reporters on Monday that his country’s trade dispute with the U.S. has affected the domestic economy, but the impact was manageable, Reuters reported. Combined, these stories tell investors that they should consider remaining cautious and viewing recent gains as a possible bear market rally rather than the end of the bear. If this was the end of the bear, there will be low risk entry opportunities on pull backs.